The Executive Committee of Kabwe Warriors Football Club (KWFC) has followed with keen interest the on-going debate about whether the 107 goals scored in the 1972 season by its striker, the peerless Godfrey ‘Ucar’ Chitalu (now deceased) should be recognised as a world record by world football authority FIFA. To begin with, KWFC, its generous and faithful sponsors Zambia Railways and its fans are delighted that this debate is happening at this time as it coincides with the club’s 50th anniversary of its founding, for which plans are at an advanced stage to celebrate the milestone. 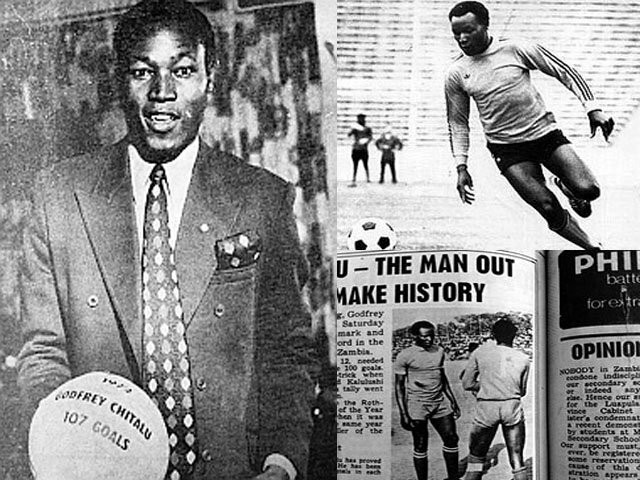 This year also marks 40 years since Godfrey Chitalu scored the 107 goals that have now ignited this very interesting global debate about whether he should now be recognized as the world record holder for the most goals scored in a calendar year. While there has never been any debate about the legitimacy of Chitalu’s 107 goals in Zambian football, an achievement for which he was duly awarded by the FAZ at the end of the same season, KWFC is grateful to FAZ and the thousands of fans who are now championing the campaign for FIFA to recognise the feat as a world record. For the record, it is not as though FIFA has been totally unaware of Godfrey Chitalu’s record. In 1982, FIFA did award him, along with other notable international stars, for his contribution to the promotion of the world’s number one sport, at a ceremony held in France. We are therefore confident that the FAZ, armed with all the statistical evidence needed to press the case for Chitalu’s 107 goals, will do its best to ensure that justice is done. As a club, KWFC has worked assiduously to safeguard its history and we are happy the Chitalu has now received international recognition whether FIFA accepts the record or not. While Chitalu holds a special place in the hearts of Zambian soccer fans, it is particularly heartening that support for him to be awarded the record for his 107 goals has come from all over the globe. There is no debate about the fact that there are now a few millions more people out there who now know about him, about Kabwe Warriors and about Zambia than did a week ago. As part of our club’s programme to celebrate 50 years of existence, the executive has already taken the decision to rename its home ground, Railway Ground, after its record goal scorer, to be known as the Godfrey ‘Ucar’ Chitalu 107 Stadium. Also, a statue of him is to be erected at the stadium and t-shirts bearing Chitalu’s name and ‘107 goals’ are to be printed to help raise funds for the club and for his surviving family, some of whom continue to be avid supporters of KWF. It is to be appreciated that during the days Chitalu was at the peak of his game, football was not as commercialised as it is today and, like most of his generation, he played for the love of the sport as well as honour for the country. It is amazing that 20 years after his death, his name has potential marketing power and it is only right that this value should accrue to his family and Kabwe Warriors Football Club. In this regard, KWFC would like to warn that it is aware that a merchandising line bearing the name Chitalu and ‘107’ goals has gone online and that this is in breach of the rights that are currently held by the club and the Chitalu family. Our lawyers in London have been advised to look into the matter. Lol! What a mouth full of the proposed new stadium “The Godfrey Ucar Chitalu 107 Stadium” – this is really playing to the gallery. I would rather it remains Railway Ground. Tshirts, that’s a brilliant idea and should be encouraged. THIS IS WHAT HAPPENS IF YOU DO NOT TREASURE YOURSELVES. YOU ARE NOW FIGHTING FOR 107 AFTER SOMEONE OVERSEAS RAISES THE ISSUE. ZAMBIA INFORMATION SERVICE MINISTRY, WHERE ARE YOUR RECORDS ABOUT CHITALU? ARE YOU NOT THE ONES WHO WERE SUPPOSED TO AVAIL THIS INFORMATION? MWALIFIPOSA. Ili ilyashi kwati nebo nasangamo ukufilwa bane. Naming the Railway Ground after Ucar is an insult to his legacy. Let Lusaka Stadium be named instead. That is an international stadium instead of some lousy pitch in Kabwe. You have got a point. Way to go. I am 56 and a football fan. I am wondering why zambia, kabwe warriors and all the people concerned did not contest the ridiculous 107 goals when Muller in the same year when he got this record, why now? Had Messi grown up in Zambia, he would also have scored over 100 goals,FACT. I left my country because of corruption and I refuse to agree Ucar scored 107 LEGITIMATE goals. Talk about the country where u are and leave Zambia to us Zambians here back home. u are a fool in another land where u owez wish u were home sweet home. Stop commenting even on corrupt Zambian issues. We dont need fools like u with inferiority complex!! I am from Chipata and I have watched zambian football.We are the same country who dont know how many caps certain players played. The report in those newspapers is drivel and contemtpt at best, 107 goals, maybe in 4 years yes. Inferiority complex from someone who calls himself a zambian and a Doctor. Fact #107 goals were scored by UCAR. Newspapaers were there at that time and proof has already been compiled.Remeber in 1972, these papers were run by muzungus (looks like you trust them) if you doubt the records… Muzungu ani konde is why i think you left zambia. A Zulu namwe nkalani zii, mutisokosela. Mulibe vokamba. I come from Lusaaka, but I started supporting Kabwe Warriors in 1972. I know warriors had great players like Sandford Mvula, Gibby Zulu, Richard Stevenson, Simutowe and the like. These were great players who could compete with the Peles of the world at the time. That was why the like of Emment Kapengwe went and played in the advanced leagues, because their talents were identified. The fact that Ucar did not play out there does not detract from his great talent. Just talking about the advance leagues of Europe does not do justice to our talented guys. Pointless campaign, my foot, what kind of people are we people from Eastern Province, always Muzungu anikonde. You hit the nail right on the head. He seems to be more concerned about Europeans’ opinions about Zambia((we are being laughed at) than about his country’s quest. # 14…Tell It Like It Is.Iwe muleke Zulu mbuya wandi.Manofye yamubula. Dr Zulu You display the copycat mind of most previously colonised NOW mentallly colonised Africans. That dictates that if something is happening in Europe then everyone must adhere to it. UEFA ranks its members for UEFA competitions-,not FIFA competitions. The African, North and South American and Asian associations don’t. But they are all FIFA members. You therefore ignore awards in these continents on the basis that they conform to european rules. Anyway FIFA has just poured cold water on the debate. They don’t recognise any top scorer award it be Pele, Muller, Ucar or Zico because they don’t keep records for national leagues.The battle is to make FIFA start to recognise national top scorers. As it is, the media are the unrecognised awarders of this record. Ati I am from Chipata, so what? And who cares. Ucar was a Zambian player who made us who were listening to radio commentaries shout with joy when he scored against several foreign teams at his peak. Ucar was a STAR not a mere mortal like some people want us to believe. Such people really make some of us upset with their Uncle Tom mentalities (read Uncle Tom’s cabin and understand certain attitudes). 2) why not in 1972 when someone did break the record? 3) What did Ucar win? 4) There is no record for this on video, why? 6) Zambia league has FAILED i recent times to even produce a premiership star, Our league is very weak! Power Dynamos won an African cup baba. Know your Zambian Football history. Nkana failed to win an African title when Mordon Malitoli missed his penalty. Dr. Zulu, missed your last comment and peace. A Zulu the final for Nkana was never played in Kitwe but Lusaka’s independence stadium. I was there cousin I doubt you were. Godfrey Ucar Chitalu has scored 107 goals more than any other player in the world. Whether be it in a minor or superior league. Dr. Zulu you are such a liar it is embarrassing. The Nkana v JS Kabylie game was not played in Kitwe where you claim you were there, rather, it was at Lusaka’s Independence Stadium and I WAS THERE. Nkana lost 5 – 3 on penalties (1 – 1 on aggregate). At the final whistle, a fun who could not stomach the loss slapped Modorn Malitoli for failing to convert a penalty. Which puts in question everything you have said about the Great Ucar Godfrey Chitalu, who I had the pleasure of watching and the honour to meet. Its a mouthful. Godrey Ucar Chitalu stadium would suffice. U could name one of the stands 107. How many strikers in whatever league can claim that no of goals? Zulu, cousin, niwe sangomba, not an educated person. Howelse can one explain your pathetic inferiority complex? Why is it that FIFA has been quiet when discussions about Mullers records and even run up to overtake it, until we challenged it? U want some European to work for as a garden boy, you welcome to Kasama! Ucar’s goals were even more than Messi’s in value, strikers then were not protected like today! Great statement Kabwe Worriors, thumb up to you for great achievements 40yrs?????? i agree with sebana wikute. One of the national stadiums should be named after Ucar, and not the Railway ground. He was a national hero for God’s sake. Argument is Messi has broken the European record not the world record; whether Ucar is recognized by FIFA or not, he was a player per excellence when it came to scoring goals, a case in point during 1978 East and Central African Challenge Cup tournament in Malawi two weeks Chitalu scored 11 goals out of the 22 Zambia scored, in that tournament Zambia mauled Kenya 9-0. maybe time has been taken by events, Maybe for our own sake, people like Daniel Kaoma, Dennis Liwewe, Walubita and other sports historians can put together all the goals scored by Chitalu (107) and all the goals in his footballing career, just as we know that Pele scored over a 1000 goals in his playing career. We need this history for ourselves more than the “World” first. I have never understood why politicians have to steal sport landmarks from sportsmen who sweat in these arenas day and night. Levy Mwanawasa stAdium? It should be Zoom Ndhlovu stadium. He identifies more with the sport than levy. Dr. Zulu you are biggest disappointment. I wonder if you grow up in Zambia. A 56 years Dr. Zulu doesnt know that the person on every matches box in every houshold was UCar Godfrey Chutalu a sportsman who scored not only 107 in a season but 11 goals against Kenya in an international match. He was only stopped when he got injuried by breaking his leg by a Kenyan player. By the way Dr. Zulu, 1990 is the only year Nkana went to the finals of the African Cup of Champions Clubs. Dr Zulu which University did u get your degrees from? I want to make sure none of my kids go there. You think like a scatterbrain bcoz Your questions above are not only so silly but divert so much from ur original argument. What did Ucar win? What a stupid question! Of what relevance is that to his having scored 107 goals? Well to satisfy an ignoramus and 56 year old soccer fan at that! Ucar won all cups in Zambia. That year Warriors won all of them. And In 1972 there were no videos! And now u have swung ur argument to Messi being better than Ucar. we are not saying Ucar was a better player than Messi we are just saying he scored more goals and that has to be acknowledged. Surely, A doctor shud be able to follow we Zambians’ argument even if he is a staunch Muzungu wanga? & please, it’s a statistical battle; not about which league is the strongest, whatever. Haters: BBC says Katongo named 2012 BBC African Footballer of the Year! Go Zambia, go! He worked very hard. His achievements particularly when he played in Europe went unnoticed and overshadowed by “big leagues” coverage of Spanish, English or Italian football! Yet if you look at his footage in many youtube videos, you will notice that he was the unsung hero living in the shadows of great players like Drogba etc! Gob bless Zambia and thanks BBC! Bane stop supporting out siders yo home is here nowhere else.u can’t say zambia is corupt that why am run away from there,u ar the one who is corupt. Don’t come back here we no u.Ucar is our hero our history. I am Englishman who lived in Zambia from 1971 to 1975 I saw G.Chitalu play several times he was brilliant, if he had been alive and playing today he would have been a great star in English football. I say thanks for the memories Godfrey.